St. Bridget’s mystic vision of the Nativity gave western artists an opportunity to explore the remarkable expressive potential of divine light. In a late fifteenth-century painting by the Netherlandish artist Geertgen tot Sint Jans, for example, the baby in a manger glows with a warm light that softly illuminates the adoring faces of the Virgin Mary and a troop of tiny angels. In a sixteenth-century Italian version by Correggio, however, the holy light shines with such force that a woman squints, and has to shield her eyes. Rembrandt, in his etching, places a candle on the wall at the very heart of the image, making light itself–as a divine metaphor–the protagonist of his Nativity scene. The drawing above, housed in Cooper Hewitt’s collection, depicts this same Christmas story, and likewise relies on St. Bridget’s account. It was created in 1766 by the Bolognese artist Ubaldo Gandolfi (1728-1781), who here employs a careful application of ink to build contrasts between areas of light and dark. 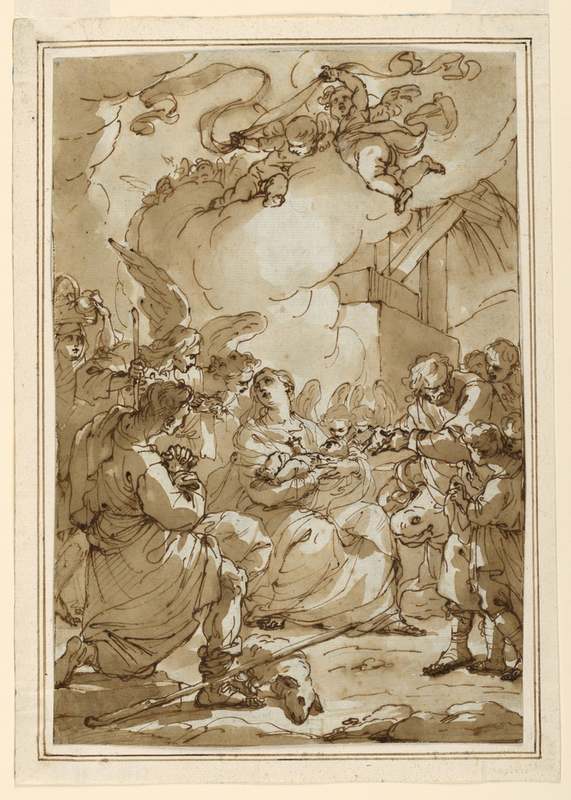 Gandolfi’s drawing makes sophisticated use of the blank white paper, using it to provide areas of highlight (such as the undersides of the clouds, and Mary’s long neck). Subtle washes of ink create shadows where the child’s holy light does not reach. The effect is as magical as St. Bridget’s account. Dr. Julia Siemon is Assistant Curator of Drawings, Prints & Graphic Design at Cooper Hewitt, Smithsonian Design Museum. St. Bridget of Sweden, Revelations of St. Bridget… (New York: D. & J. Sadlier & Co., 1862), 38. Lovely and informative post for December 25.